Bingosaurus is the next level of bingo playing! 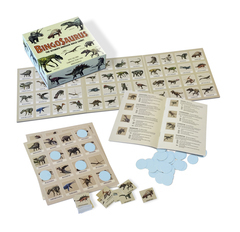 This game features 48 dinosaurs, all of which are brought to life with stunning illustrations. 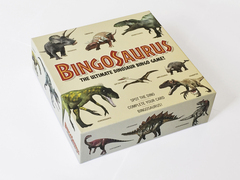 The box contains a beautiful masterboard for the chips to be placed on by the caller; 48 chips, each showing a different dinosaur; 8 game cards allowing up to 8 friends to play together; over 120 counters to be placed on the game cards; two bags – one for the counters and one for the chips; and a 16-page book. The book features both the rules of the game and profiles of all the different dinosaurs, from Amargasaurus to Velociraptor. Each profile includes a pronunciation guide, brief introduction as well as four facts about the dinosaur, which cover everything from their diet and what period they lived in to their key features and what their name actually means. Tags: bingo, board game, game.